The Killen Founders Day 5K took place today, Saturday, Aug. 22 with 263 finishers. Hirbo Hirbo, 23, of Russellville, was winner in 15:42. Sandy Lynch, 40, of Florence was the top female in 19:58. Click here for results from the one-mile fun run. Yes, I realize I still have quite a handful of results to catch up on and I'll still do that bit by bit in the next few days. For now, though, I thought it best to not get any further behind! Thanks for visiting North Alabama Runner! Click here for an update on the gender test for the female? runner previously mentioned in this post. 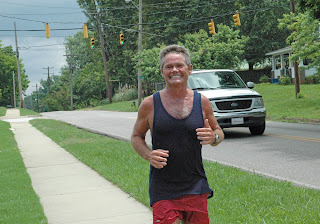 Mark York, 41, of Athens ran the Heritage Hustle 5K in Lawrenceburg, TN, on May 30, taking second in his age group in 24:19. Note: I don't know the date of this race, nor AG results. Sorry. 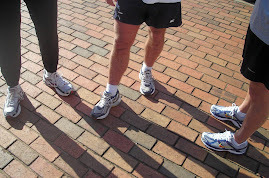 From time to time we include here on North Alabama Runner national or international news articles about running. **Rocket City Research Run 5K, which took place on May 9 in Huntsville with 85 finishers. Click here for results. **Steeplechase 8K, also May 9, in Decatur. The Jesse Owens 10K takes place in Moulton, Ala., each May. This year's race was held on Saturday, May 16. This is a really, really big race! Here's the link to the results page. Rather than spend hours reviewing the results for Athens-Limestone names, I'm going to ask anyone who ran and wants their time posted here to please leave a comment with your name, age group, and whether you ran the 10K or the 5K. I'll be happy to look up your time for you! A review of Tanjie's photo files indicates that at least she had good intentions. She pulled over and jumped out of the car just to snap this pic of Phillip one day back in May. Thanks for visiting North Alabama Runner. First and foremost: Please accept my most sincere apology for the long gap in blog posts. As I believe someone has mentioned on facebook recently (it may have been Eric or Mark) I have been on an extended vacation on an isolated tropical island with no internet access. It was lovely and I got some much needed rest but upon my return -- and much to my dismay -- I discovered that my once-trusty and dependable Gal Friday, Tanjie Schrimsher, had lost all her trusty dependableness and hadn't updated North Alabama Runner in months! And during prime race season, no less! Rest assured, she's been severely reprimanded and I intend to also serve up a stiff dose of public humiliation for her later on but for now, let's just get back to the business of offering kudos to those making strides in the North Alabama running community. As mentioned in a previous post, Kathy Youngren ( a Decatur High School graduate and Madison resident ) participated in the Badwater Ultra Marathon in Death Valley back in July. Click here for a DecaturDaily article on her most admirable accomplishment. It'll take a while, folks, but I intend to somehow catch up on the summer's missed races. Thanks for your patience.